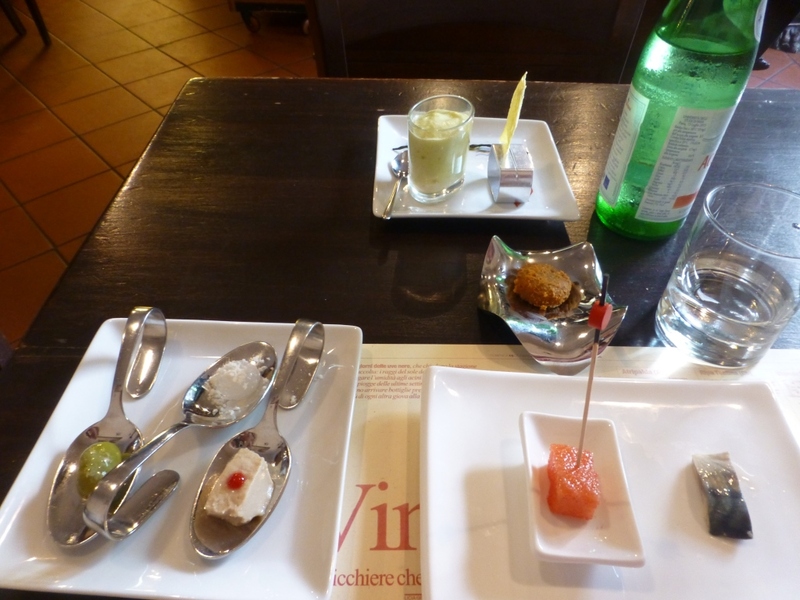 After booking one restaurant in Milan for lunch, I was still in search for a dinner restaurant. Al Pont de Ferr popped up as a possibility after continued searching. I think I ran across the name somewhere in a travel article or food article. When I looked up the restaurant, it sounded like a good candidate for at least some dishes made with a modernist approach. I emailed them for a reservation and received a prompt response. The restaurant is located in a part of the city I had not visited before. It was just beyond the central part of Milan, but still reachable very easily by the Metro. The restaurant was situated on a canal lined by restaurants and bars, so it was a relatively high-traffic area for people strolling. There was a window into the kitchen from the sidewalk. The restaurant itself had an informal look. The menu had an a la carte page. After that, there were a few different tasting menus from which a diner could choose. There were a couple of shorter tasting menus, called Traditional and From the Vegetable Garden (vegetarian).